Myriad's Alien Dalvik system, for which we wrote back in February, can be used to run native Android apps on MeeGo, and is expected to hit commercial availability sometime this year. A strong incentive for its development have been car companies, since MeeGo has been slated for car use for a while now. BMW, GM, Hyundai and others have signed up for the software already, which would allow Android apps to be easily ported to their MeeGo-powered dashboards. The Alien Dalvik system developer, Steve Troughton-Smith, has reminded about its creation in relation with the freshly announced Nokia N9, which is running MeeGo. Myriad's software promises ported Android apps performance that is indistinguishable from native apps. App store owners, OEMs, carriers or developers have to first repackage the app, for it to appear in the list of your available applications on the device. The ported app can make a full use of the phone's hardware capabilities, and if some tweaks are needed to use this and that feature, they should be easily made via the Android SDK plugin. At least that is what Myriad claims, we will see how it will be implemented when the software becomes available later this year. If the process is made seamless, there will be a lot of playtime with the Nokia N9 - you'll be able to keep the unique swipy MeeGo interface, and still run a number of ported Android apps, provided that Alien Dalvik gains traction. If the Nokia N9 asserts itself as an enthusiast device, like the Nokia N900 before it, these kinds of projects can bring a lot of added value to the handset. That's exactly the kind of demonstration Myriad gave at the MWC expo this year, running Android apps on a Nokia N900, of which we are embedding a video below. And what about Android Market? Why should I buy Meego device to run Android apps? I can buy easily an Android phone then. with a MeeGo device you can run not only MeeGo native apps but also Android, webOS and Linux apps!!! MeeGo gives you a real freedom because it's a real Linux but not a virtual machine like Android! But not apps from the AppStore :) Which would keep the iphone an EXCLUSIVE device, and not some generic platform for the masses like android,ewwww. in other words.... meego CAN run any apps from any flatform:) may it be an android or A windows OS^^ ..no restrictions:)..
Hmm, Nokia may not be dead after all. 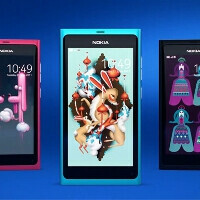 The N9 seems really, really boring..
where are you from? Mars? Don't you see how awesome this phone is? MeeGo can basically run apps from other OSes! Is there any other operating system in the market that does that? And are you blind? Don't you see how gorgeous that phone is? It IS Nokia's saving grace. Wow guys guys, learn to read please. First of all - how the hell did you bring WebOS as well as MS Marketplace to Meego?! MS Marketplace is only available to WP7 devices. And this ain't one of them. Not even talking about WebOS. Second of all - there is something critical that you've all missed. Here's a direct quote: *If the process is made seamless, there will be a lot of playtime with the Nokia N9 - you'll be able to keep the unique swipy MeeGo interface, and still run a number of ported Android apps, provided that Alien Dalvik gains traction. * That's a lot of IFs there - and I think that they key word is "Number". I seriously doubt it that any device not based on Android can run seamlessly every Android app. That's even before we run into hardware compatibility issues and such. So please, calm down, and let's all of us wish Nokia a very nice place in eternal heaven where it has actually been since the very first iPhone was announced in 2007. I thought you were saying something valid and constructive, until I read your last paragraph. Now I think you're just a brainwashed idiot. I am saying something valid and constructive. Look at Nokia post 2007. Can you name ONE device that could compete at the time with iPhone and/or Android in ease of use and power? We are talking here about a company which put a RESISTIVE "touchscreen" (because it's actually a pressure screen and not a touchscreen) device in late 2008 - based on the horrid S60v5 - and called it an "iPhone Killer". Nokia is dead. I seriously don't see why people keep putting faith in that dead horse. Their only saving grace is probably WP7, if at all. Microsoft announce a tool to port Android apps to Windows Phone a while back, it was called the "app guy" or something. That's basically still Android apps but well, you can still get those from Marketplace literally. And Nokia Store and MarketPlace will soon be as one when the Nokia Windows Phone comes out. My mind is blown away. Nokia can still be saved :D .... now lets wait to see what RIM has up its sleeve. yeh!, nokia is back !!!! I've been saying it since the n900 came out...if Nokia just developed the maemo OS more, they could have had a real contender. It frustrated me to no end that I spent over $500 on a n900, and Nokia provided zero to little support for such a promising OS. Hopefully the N9 turns out well, because it's a beautiful piece of hardware and the software looks GREAT!